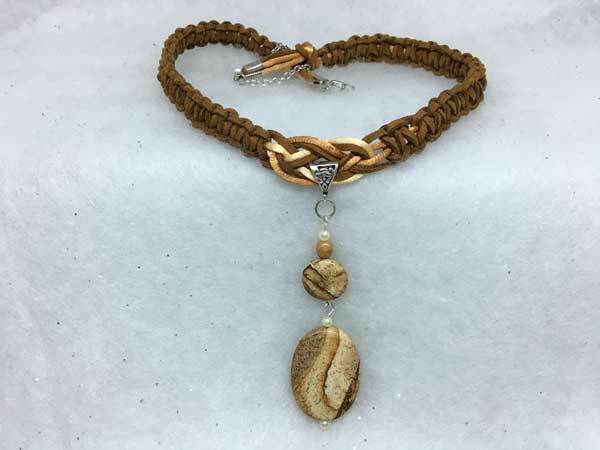 This corded necklace is made using suede cord in combination with two shades of satinique cord, done in ivory, light brown and cinnamon. The length can vary from about 17 to 20 inches with a center jeweled piece that adds 3.5 inches. The jeweled piece starts with a medium-sized stone coin in marbled shades from ivory to dark brown. Atop that is a fully-faceted caramel round and a tiny ivory pearl round. Hanging separately from that, for added movement and sparkle, is a gorgeous marbled stone oval, in the coordinating colors to the coin bead. It is surrounded on top and bottom with an tiny, ivory pearl bead.